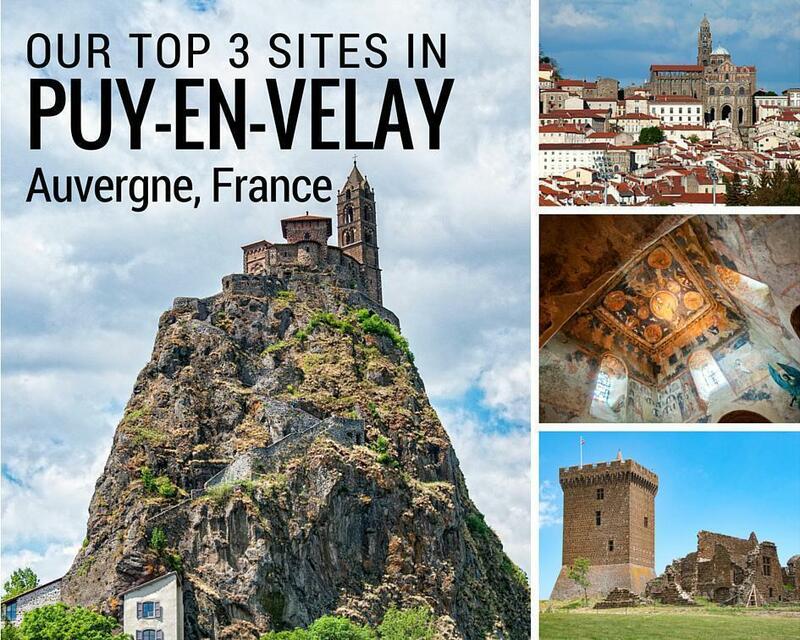 If you like architecture, history, or buildings perched on volcanic spires you need to visit our top 3 sites in Puy-en-Velay, Auvergne, France. Alison is much better at geography than me. She’s spent hours poring over maps, noting the UNESCO World Heritage Sites, and planning places to visit on our motorhome adventure. It will come as no surprise, therefore, sometimes I had no idea where we were going (or why) until we got there. 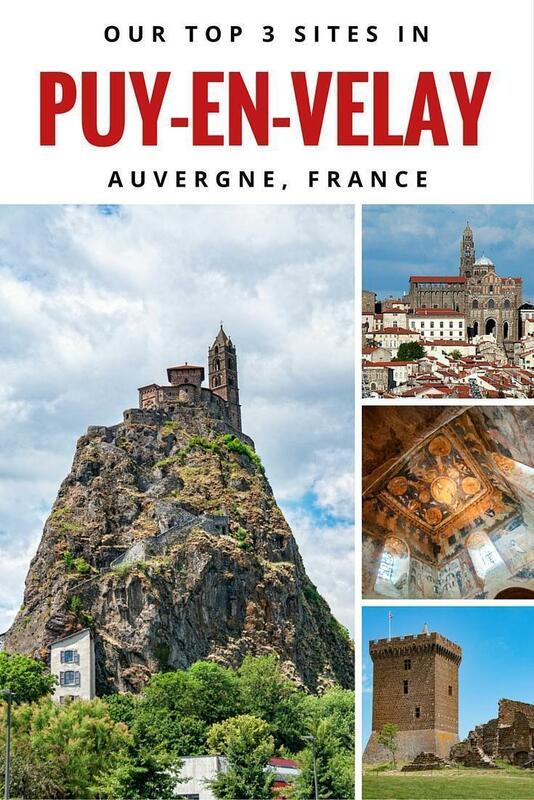 Puy-en-Velay, in Auvergne, France, is one such place. 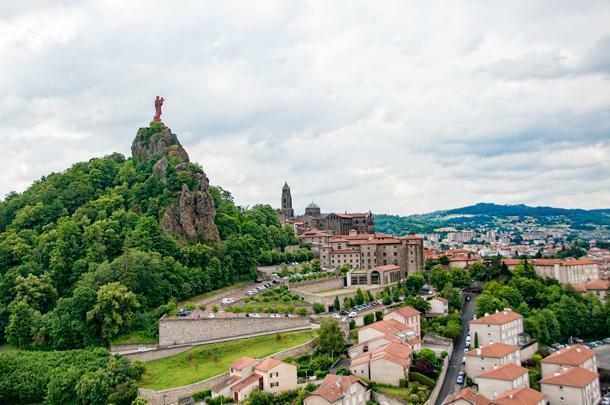 Puy-en-Velay (or Le Puy for short) is famous for two main reasons: it is a starting point on the pilgrimage to Santiago de Compostela and is home to a type of lentil. When I learned this, I finally put two and two together and realized this is where Puy Lentils originate. These small green beans had featured in numerous of Alison’s home cooked meals for years and are delicious. I had no idea they came from a town called Puy(-en-Velay). I just figured that was their name! Consider me educated. 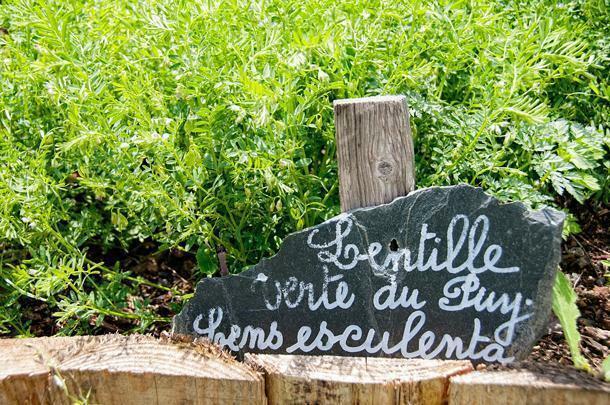 Beyond the fields (and fields) of lentils growing in the early summer sun, here are three places you should visit in Puy-en-Velay. 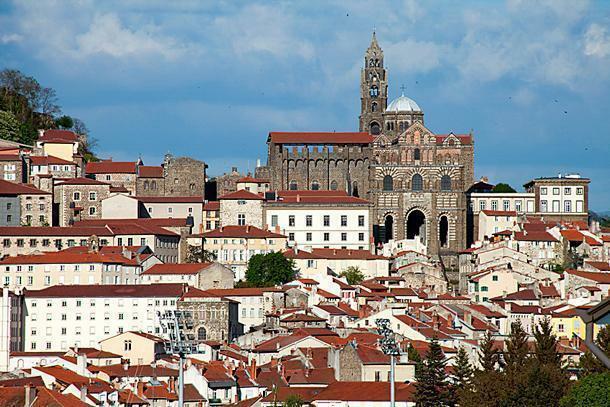 Le Puy’s Notre-Dame Cathedral is one of the city’s big attractions. Featuring architectural elements from the 5th century onwards, the bulk of the cathedral was built in the 12th century, using layers of white sandstone and black volcanic rock, giving it a striped appearance. The light/dark combination reminded me immediately of the red-white arches in the cathedral-mosque of Córdoba, Spain. The cathedral is itself, a site of pilgrimage, as a centre for the cult of the Virgin Mary. However, it is most famous for being one of the four major French cities on the Route of Santiago de Compostela. Every morning, pilgrims setting out for Santiago de Compostela gather to be blessed. Since 1998, the cathedral has been part of UNESCO’s Routes of Santiago de Compostela in France. 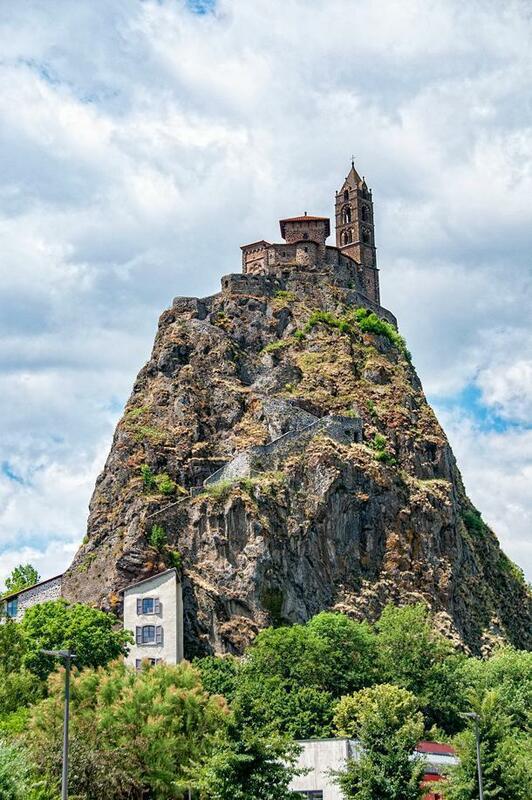 Although the cathedral is impressive, what caught our attention was a building perched on the top of a spire of volcanic rock, the Chapel of Saint Michel d’Aiguilhe. All the hills around Puy seem to be volcanic, as the softer rocks have eroded, over the millennia, leaving impressive columns and ridges of basalt. It is upon one of these needles of rock the chapel sits. Built in 969 and extended in the 12th century, reaching the chapel requires walking up 268 steps, carved into the black rock in a twisting series of switchbacks. There is nothing else on this rock, just the chapel, with its spire reaching to the sky. The hike up the stairs isn’t for the faint of heart, but there are beautiful views of the city along the way, providing an excuse to stop and catch your breath. The chapel itself is unique; the irregular layout accommodating the shape of the rock. Built in a Romanesque style, the facade dates from the 12th century and features multicoloured stonework, with carvings reminiscent of the Islamic carvings we saw in southern Spain. The interior is atmospheric; dark but not somber. 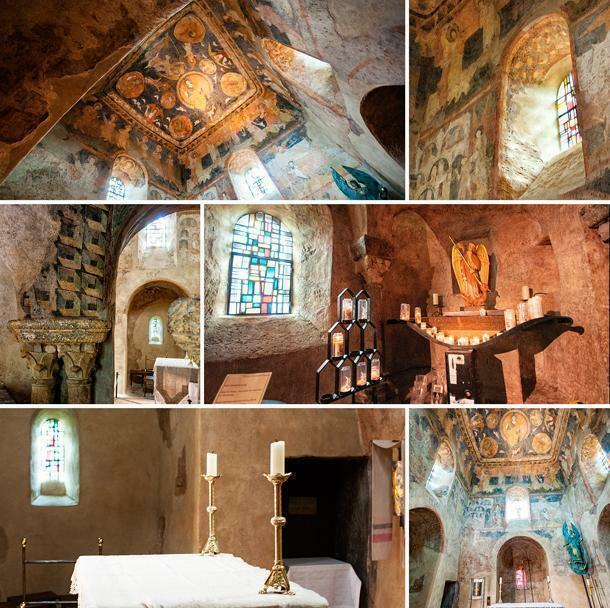 Candles and small stained glass windows make the walls glow with soft light. 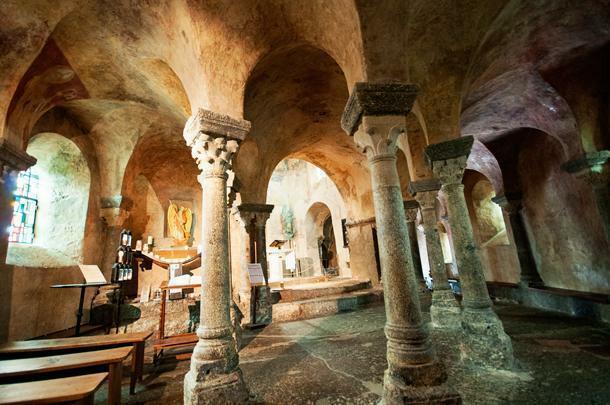 Stone pillars and arches surround a central sanctuary. The walls and ceilings are covered with frescos, many of which are not in great shape, but you can still admire the colours and attention to detail. I particularly liked the alcove above the entrance where the ceilings are lower and the frescos are easier to see. 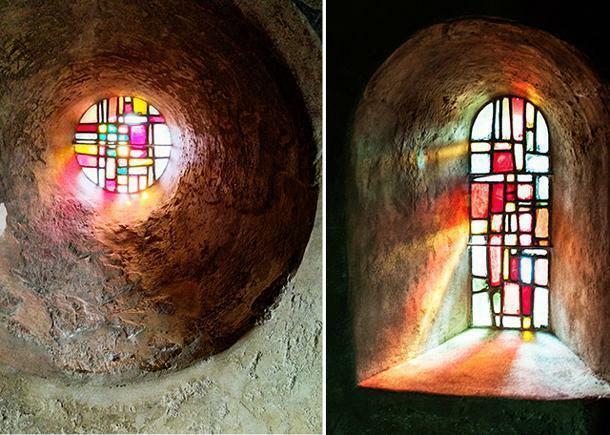 The round stained glass windows were also beautiful, with the square, almost Mondrian colours framed in a circle. Stunning. This chapel, rising straight up out of the rock, should be on everyone’s list to visit. 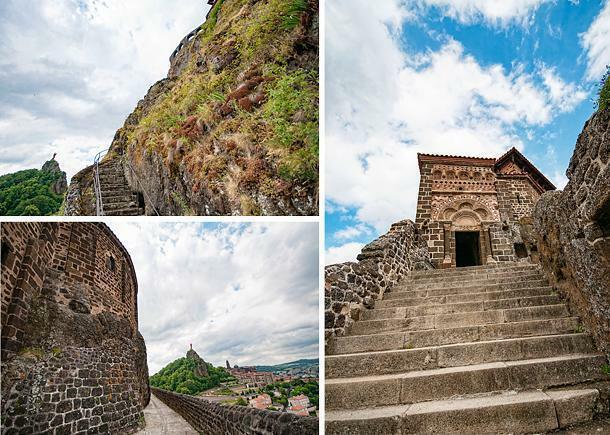 Situated 5km northwest of Puy-en-Velay, the Polignac Fortress is an impressive set of battlements, sitting on top of a basalt ridge. Built as the feudal home of the lords of the region, the position dominated the routes to the north and west of the city. 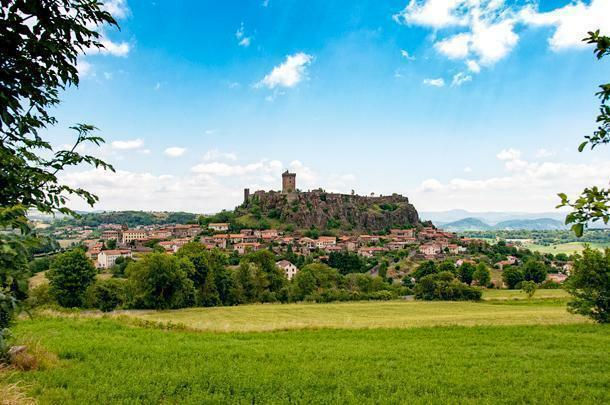 This fortress was home to the Counts of Velay, who benefitted from being closely aligned with the French kings. At its peak, the fortress housed up to 800 troops, the lord and his family, and numerous servants. In its day, it would have been its own small town. Today the fortress is a faint shadow of its former glory, but it is still dominated by a tall square tower, the donjon (or castle keep). Walking up to the fortress, visitors wind through seven gates protecting the entrance. Emerging onto the plateau, a path wanders around the vast site, with numbers corresponding to information on a paper leaflet. Most of the original buildings disappeared years ago, probably as a result of people reusing the stone for their own houses. However, there are still a number of buildings left, as well as fabulous views from the walls. Visitors are free to wander around most of the site. When we were there, a few sections were cordoned off, because the remaining walls were unstable. 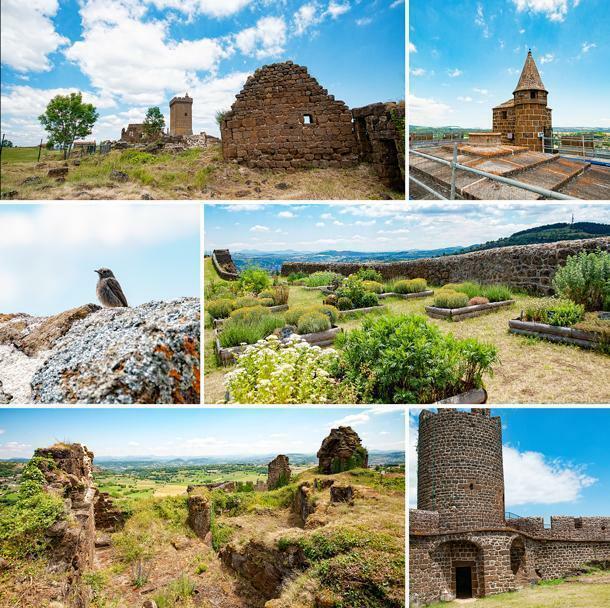 With a site as large as the Polignac Fortress, they must be constantly battling the elements, to keep what is left from crumbling even further. We were almost alone during our visit, giving us the freedom to explore where and when we wanted. I love open visits like this because I am able to wander wherever I feel drawn. As Alison will attest, I am usually drawn to the top or edge of things. But that didn’t stop us from admiring the view from the roof. We walked along the walls and to the top of the tower (yes, more stairs!) for a spectacular view out over the surrounding valleys. We descended into the remnants of the lord’s residence and around the old bakery. I’d love to go back for a guided tour because I feel there is so much more to learn about the family, the area, and the fortress. Bonus Tip: If you are in the area around November 11th, you’re in for a special treat. In early November, every year, a local hot air balloon company organizes an international hot air balloon festival. It would be an amazing sight to see and to participate in. They’ve released videos of previous years on YouTube so you can watch the video from the 2014 Hotair Balloon Festival. What a fabulous sight to see all those colourful balloons lift off into the morning or evening sky. 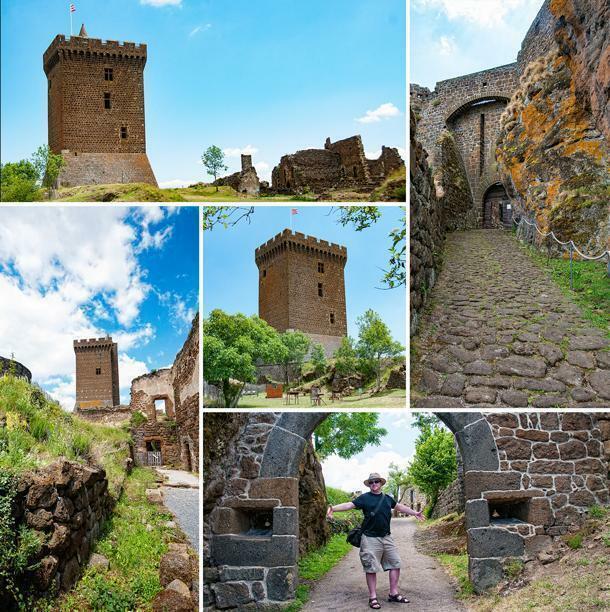 I am sure there are more things to visit in Le Puy and the surrounding area, but these three locations are at the top of my list. Have you been to any of these places? Share your thoughts on visiting the area in the comments below. 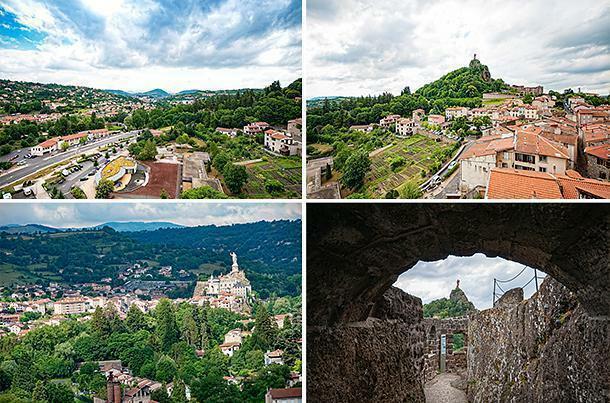 We’d like to thank the Région Auvergne Tourism office for hosting us in the area. As always, all opinions are our own.